Its been a while since I was able to make an entry, in no small part because my visa finally arrived and I had to scurry to pack and get on a plane. What follows may be a little long, but it is the story of how I have come to Tabuk, KSA from Seattle, USA. The first leg of my journey involved a flight on Condor airlines to Frankfurt. Now, I admit, I haven’t flown into Europe as an adult before, so I was going from memories of flying in and out of China as to how much luggage I should be allowed, because I needed to start packing before I got the plane ticket from my company. After packing and repacking about 3 times, I got the reservations, and read the Condor luggage policy. This may be a great budget airline if you’re going on a short trip or vacation, but for moving overseas, the luggage restrictions and prices for breaking these make you think stereotypically negative things about Germans. One 23kg checked bag, no more than 158cm (add height, width & length), and one carry on, no more than 6kg. !!!!! I had to buy new luggage two days before leaving because mine was a few cm over size. I had to repack 3 more times, stepping on and off my bathroom scale trying to make sure the suitcases didn’t go over weight. This may be the worst airport in the developed world. Do not fly through here if you can avoid it. There were no eateries. The only shopping was the duty free shop, so unless you wanted chocolate, there was no food available anywhere in the concourse. This is fine if you’re passing through quickly, but I had a seven hour layover after my ten+ hour flight from Seattle. No food, no coffee, and the ONLY bathroom was at the far end of the terminal on the third floor. 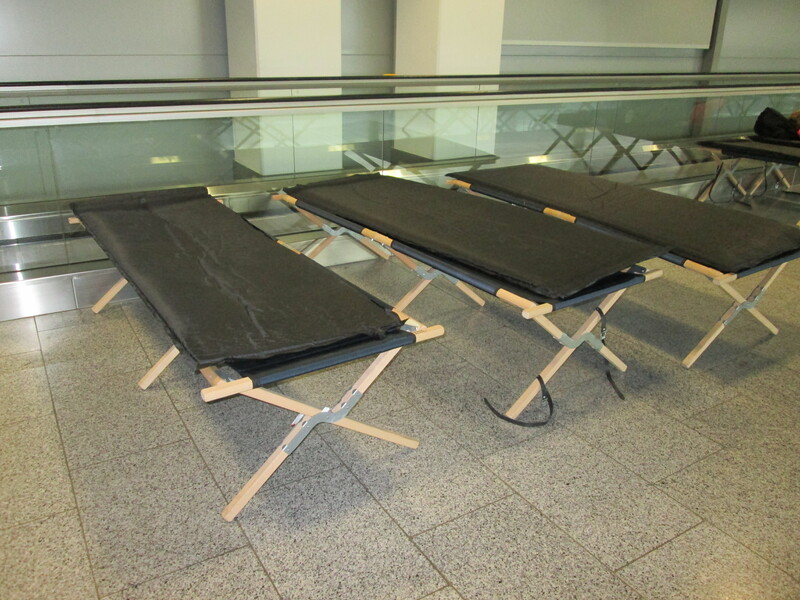 In fact the only nice thing about the airport were the cots that lined all the walls where travelers could enjoy a nap. We even had to go back through security even though we’d all just gotten off the plane. On the far side of security there was another duty free, a tiny expensive cafe, and (thankfully) another bathroom, but not much else. I was told by another weary traveler that Munich airport is much better, so if you have to do a layover in Germany, maybe best to try that one instead. Lufthansa, in case you were wondering, same basic service as Condor, but less extra costs. The special meal was free, and the tv was free. I realize these are small things, but when you’re traveling for days, it really starts to matter. Any further review of this leg of the journey would devolve into movie reviews, since I took the opportunity to see a couple summer films that I’d missed out on. Approximately 24 hours after I left Seattle, we touched down in Riyadh. 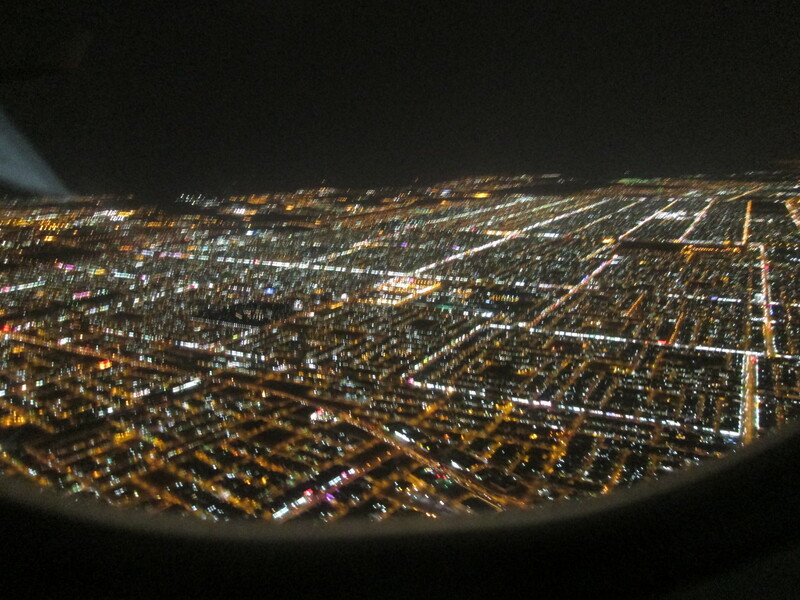 From the final approach, the city was a field of lights. It is very flat, uninterrupted by trees, or bodies of water, just miles and miles of lights. Before getting off the plane, I fished my abaya and hijab out of my carry on bag, like most of the other women on the flight, so that I could be appropriately dressed as soon as I set foot on Saudi soil. The airport was clean and beautiful. Contrary to many other stories I had read, I had a very smooth trip through security and customs. First, at a sort of immigration area, all first time visitors to the country had to register finger prints and face photos. Rows of individual desks, the clerks behind glass were all dressed in the traditional Saudi men’s wear of the white Thobe and red and white checkered Shemagh. The line I joined was having some trouble with the fingerprint reader, and the man there was clearly frustrated, but still nice to me. When I finally was sent to the next kiosk over, that gentlman spoke some English, and we exchanged pleasantries, including the seemingly obligatory conversation when someone finds out I teach English, a joking request for tutoring and an unspoken fish for a compliment on their current level. Customs didn’t even have a declaration form, and all we had to do was run our bags through an x-ray one more time. Then I was out, and my driver was waiting right outside the doors with a sign. He was a very friendly young man from the Philippines who had been working as a driver for three years. His family is still back in the Philippines. When he asked me which state in America I was from, and I told him Washington, he proudly announced that the capitol was Olympia and that the state was located in the northwest next to Canada. Honestly, it sounds silly, but I was impressed. I felt like this guy was really interested in the world, and trying to learn things even though he was stuck driving a van so far from his home and family for so long. On the drive to the apartment where I would stay until my next flight, he pointed out many landmarks to me, inlcuding the Princess Nora University, which is the largest women’s university, and boy are they not kidding. He told me as we spent several minutes driving past the campus that students took a train to get across the campus because it was so large. I was put up in one of the teacher apartments. It was large, to be sure, but I have to say I’m pretty happy that I’m not living there. It bore some sad resemblances to my place in China: dirty, falling apart, and the shower was just a showerhead in the wall with a drain in the bathroom floor. The bed was pretty, but it became obvious quickly that this was an illusion, since it was just a sham cover over an old mattress. I actually got a fabric burn on my leg from sleeping on the rough material. 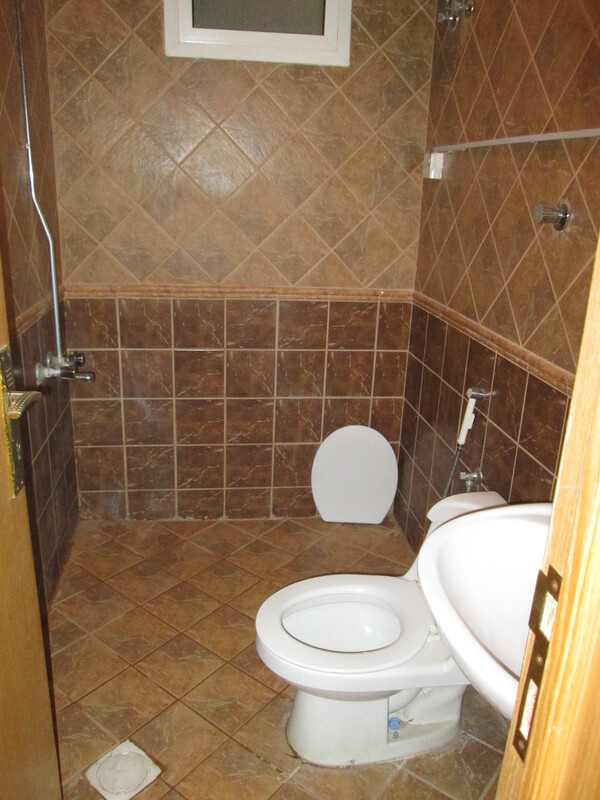 There was no food awaiting me, and not even any toilet paper in the bathroom (fortunately, I always travel with some). But, fine! I think to myself, I’m going to be out on a flight the next day to a luxurious western compound in Al Ahsa, I can handle this. Yes, I said Al Ahsa, not Tabuk, just keep reading. So, after a few fitful hours of sleep, I head downstairs to meet the driver to be taken to my medical exam. Sadly, the friendly Philipino was gone, and in his place a recalcitrant Indian. Not mean, just not really interested in making conversation. I tried to ask him if we would be coming back to the apartment before heading to the airport later that day, and he said my flight to Al Ahsa was canceled, and I was staying in Riyadh. !!!! I rode to the medical exam in shock and silence. Not only was the apartment really shabby, but the neighborhood was bleak and barren. There were no nearby shops or markets, and the area seemed under a long term construction project. Was I really going to be stuck there? I watched the city go by through the darkly tinted window of the company van. In the residential areas, once we got out of our shabby area, I could see the palace like homes of the wealthier Saudis hiding behind sand colored walls. In the more industrial areas, the city reminded me a lot of China. All the pictures I’d seen of Riyadh online made it look like a sleek metropolis, but in reality it seemed every building was under construction. Incomplete skyscrapers were adorned with scaffolding and cranes. Piles of dirt and rubble piled up in construction sites and huge concrete frames of buildings sat, seemingly abandoned in the middle of being built. In its advertising sense, everything was either sand colored or tremendously gaudy. Nearly everything was in English and Arabic, so I had very little trouble reading the ads and shop signs. Fast food and American brand restaurants were clustered together between clothing and furniture shops. Nearer the end of the ride, we passed through a small market area where men sold fruits and vegetables on carts in the street in front of smaller less Western looking shops. Nearly everyone I saw was male. Only a couple of black shrouded figures broke up the all male continuity of the area. The medical exam went quickly, as all they needed was blood, urine and photos. On the way back, I asked the driver if we could pick up some food, since I hadn’t had a meal since the flight into Riyadh the day before. He seemed to soften up a little at this point, and began talking about the market options. He wasn’t sure if the supermarket was open at that time on a Friday, but he promised if it wasn’t, we would find a convenience store, then he would come back for me after Duhr prayer to try again. The market turned out to be open, hooray. He dropped me off at the door, saying I should go on and do my shopping, and that he would park the car and find me inside. Still unsure of how long I would be in Riyadh, I didn’t want to buy too much and not be able to take it on the plane, so I got some chicken biryani, some yogurt, some fruit and some chocolate. I paid for my purchases and stepped back into the air conditioned space between shops, looking for my driver, but he was nowhere to be seen. I am a good adventurer. I am usually well prepared, having the name, phone number and address of where I’m staying available on hand. A lot of hostels offer little cards at the check in desk so you can just show them to a taxi driver. I usually get myself from place to place, and tend to spiral outward from easy landmarks. None of this was any good in this situation. I had no phone, and the phone numbers I had for anyone in Riyadh were all in my email. Aside from this, I had no idea where I was staying, no landmark or point of reference, no name of a hotel, just an anonymous apartment complex somewhere in the sand colored city. And even if I knew, how could I, as a woman alone, possibly catch a taxi? I didn’t panic, at first. I walked around the mall’s central area a few times, but to no avail. I’d like to think that low blood sugar and sleep deprivation were the primary cause of my emotionality, but this was one of the scarier situations I’d found myself in. I knew, logically, that the driver couldn’t possibly leave me. He was employed by my school, and I’m sure he would be in lots of trouble abandoning a teacher, so I knew this couldn’t be the case. But I had no control, no back up plan, no ability to be self reliant. Thoughts whirled around my head: could I maybe approach another foreigner for aid? would they let me use their phone to look up the number and call for help? What would happen if the mall closed for prayer while I was still alone? I wanted nothing more than to find the ladies room and have a good cry, but I couldn’t risk being out of sight in case my driver turned up. So, I sat in what I hoped was a visually conspicuous place near the main entrance and waited. Suddenly the whole journey caught up with me. The luggage, the lack of sleep, the horrible Frankfurt airport, the lack of food, the shabby apartment and the massive uncertainty. Tired, hungry, lost and alone, feeling more helpless than I had in any other similar situation, I pressed a tissue into my eyes to keep from becoming a spectacle in public. After an indeterminate amount of time, the driver finally descended the escalator. He had several shopping bags. I was so amazed that he would take his time shopping here without even letting me know! On the way back, I think he might have sensed I was unhappy, because he tried to tell me some other helpful things about our neighborhood. He pointed out where there was a small market about two blocks away and drove slowly by it so I could see the streets and landmarks clearly. He also made sure I had the internet password before he dropped me off. I managed to log in, and get to my email before finishing my meltdown. The school had decided, since I requested to work in Jeddah that they would move me to Tabuk instead… This makes no sense, and also means I don’t get to live in the super luxurious compound at Al Ahsa which had a pool, a gym, a jacuzzi and a resident masseuse. Some friends from Seattle spent a while talking me back to sanity, and the chicken biryani helped a great deal. I pretty much spent the rest of the day sleeping as the jet lag finally caught up with me. The Riyadh airport that seemed so welcoming when I arrived at the international terminal became a daunting mass of conflicting instructions once I was in the domestic terminal. I knew that I would need to pay for my second bag, but what I did not know was that this would mean about 30 minutes of wandering all over the terminal looking for where to do this… at 430 am. Security was also interesting. There was a ladies line for security which turned out to be a shorter line and a largely hassle free experience. After putting my carry on bags on the machine, I stepped into a separate area to go through the metal detector. When it beeped as I walked through, I realized I’d left a metal hair clip in my hair. I took it out, thinking I would need to walk through again, and indicated the offending metal object to the female security personnel there, and she simply waved me on! My steel water bottle fell out of my bag on its way through x-ray and it took some pains to retrieve it. At first I simply tried to get someone’s attention to ask about it, but the one person who I got responded that he didn’t speak English. Unwilling to give up on my favorite canteen, I looked around the area for it, and finally spotted it under the conveyor belt. After a few more tries, I managed to get the security guys to look at me, whereupon I pointed to the bottle where it had rolled on the floor. I don’t think they were trying to be rude, it felt more like they simply couldn’t imagine that a woman would be trying to talk to them. They seemed surprised when they finally realized I was addressing them, but once they spotted the bottle I was pointing to, they quickly retrieved it for me. The terminal was interesting, full of kiosks selling coffee, ice cream, snacks and sweets. A crowd of young men were gathered near a sign that advised there was a 200 Riyal fine for smoking there, but that the smoking room was that way. They posed, in defiance or self-importance, or simply lack of caring, a variety of traditional thobes and modern jeans and t-shirts, smoking their Marlboros next to that sign. I managed to find a bottle of water, using the last of my US currency to purchase it, and receiving my change in Riyals. When it was time to board, we huddled up around the gate. I didn’t expect neat lines, because I was warned, so I just pretended I was boarding a bus in China, and was fine. Once we got past the gate, we were led downstairs and outside into a bus… which then drove us for quite a ways to an airplane just hanging out on the tarmac with a staircase. I may never know why. The flight attendants had the cutest little blue hijabs with a little built in hat. They also wore pants suits instead of abayas. It was interesting to see how professional women dressed and acted differently. The nurse at the medical exam place had been the same. After collecting my luggage I headed out and found a friendly [redacted] named [redacted] holding a sign with my name. He turns out to be the [redacted] on the men’s side, but had taken it upon himself to come and greet me because the driver didn’t speak any English. 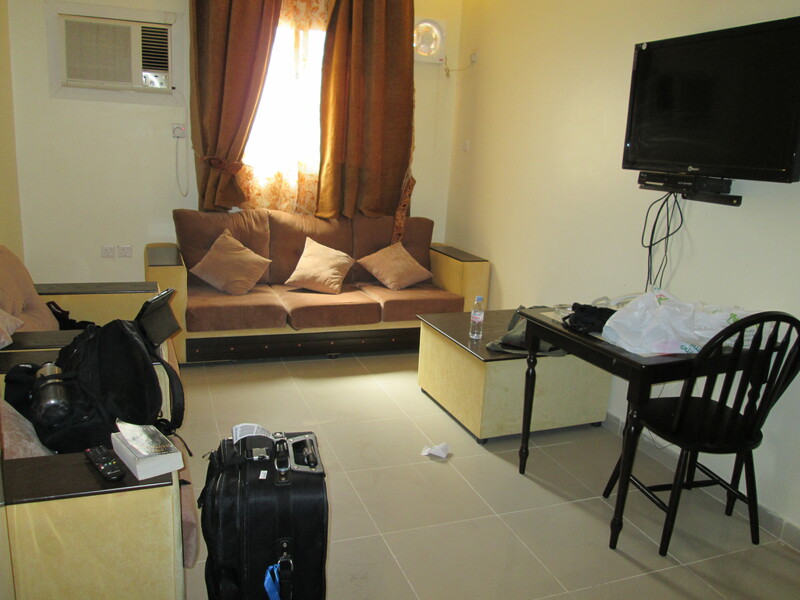 We chatted on the short ride to the hotel, and I got some details about life in Tabuk. The hotel where we live is nice enough. Nothing compared to the compound I was expecting in Al Ahsa, but its walking distance from a good shopping market and several smaller shops and restaurants. After helping me get my things to my room, we went down to the grocery store so I could pick up some things. I didn’t really know what to get, yet. Last time I did this kind of thing, I made oatmeal for breakfast and ate every other meal out. But its not far, so I can go back on my own when I figure out what I need. We’re going to get dinner at the Schwarma place next door in a bit, and tomorrow I start work.